When the Egyptian king Ptolemy Philadelphus, founder of the glorious library of Alexandria, wished to have the Old Testament books in the Bible translated from Hebrew into Greek, the Jewish Sanhedrin (High Council) chose 72 righteous men from among the Hebrews, six from each tribe of Israel, who knew both languages well. Among these 72 men was a certain elder named Simeon. While translating the Book of Isaiah, he stopped at a prophecy well-known to him: “Behold, a Virgin shall conceive and bear a Son…” (Isaiah 7:14). Simeon had doubts about the word “Virgin,” and after pondering for a while, decided to replace it with the words “young woman,” as being more understandable and believable. But suddenly an angel appeared before him and, staying his hand, said: “Believe in what is written. You shall see with your own eyes the fulfillment of this incomprehensible prophecy.” This took place about 270 years before the birth of Christ. And so years, decades and centuries passed. Simeon patiently waited for the fulfillment of God’s word, announced to him by the angel, and daily visited the temple of Jerusalem. And thus, when the Most-Holy Virgin Mary, in accordance with the law of Moses, brought the Infant Christ to the temple on the 40th day after His birth, Simeon was divinely inspired to recognize Them, together with the prophetess Anna who lived at the temple. Piously he bowed down to the Infant and His Mother, and taking the Infant God up in his arms, he turned to Him with the following moving prayer: “Lord, now lettest Thou Thy servant depart in peace…” (Luke 2:29-32). We read this prayer at the end of each vespers, at the end of the day, which symbolizes the end of life, since sleep is the foreshadow of death. Thus the holy prophet Isaiah’s words came to pass, and the righteous Simeon’s expectation was fulfilled: in the temple he met Christ born of a Virgin, and for this reason the holiday is called the Meeting of our Lord. For many years afterwards the event of Christ’s presentation at the temple of Jerusalem was commemorated, but after a while the memory of this event apparently began to fade. And then in 542 A.D. there was a terrible plague in the Byzantine Empire, so that many thousands died every day, and the bodies of the dead lay for a long time without being buried, while in the city of Antioch another natural disaster was added – a severe earthquake. Many buildings were destroyed, burying in their ruins those who had survived the plague. At that time a certain pious person received a revelation from above that people should begin celebrating the day of the Meeting of the Lord, as well as other feasts of the Lord and the Theotokos. Thus, on the eve of the 40th day after the Nativity of Christ, i.e. the day of the Meeting of our Lord, when the all-night vigil was served, followed by a procession with the cross, – the plague and the earthquake immediately stopped. The joyful inhabitants gave glory, praise and thanks to the Lord God and His Most-Holy Mother. 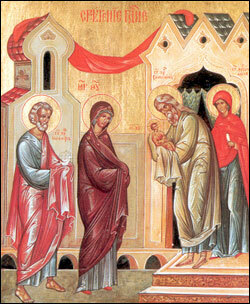 The meeting with the Infant Christ had great meaning for the elder Simeon. But what meaning does it have for us and for our salvation? To understand the deep significance of this holiday we must turn to the service for this day, because the Holy Church has expressed its understanding of Gospel events most fully in its services. “In the Law – in the shadow and in the Scriptures – do we, the faithful, behold the symbol: every male child opening the womb is consecrated to God…” (9th ode of the canon). In the Old Testament law, which only served to foreshadow the coming law, each first-born male from each family of the chosen people was dedicated to God. This law was established at the time when the Lord smote with death all the first-born of Egypt, sparing the first-born of the ancient Jews, who henceforth began to be considered as God’s property, and whom their mothers were obligated to give over into full service to God, i.e. consecrate to God, in other words – make them their priests and intercessors before God. However, since many families found it difficult to give up their first-born for service to God, Moses, not without God’s approval, modified this law to some extent, replacing the first-born from each family with a universal first-born from the entire people – with the tribe of Levy, which became totally dedicated to God and became the priesthood of the ancient Jews. In order to authenticate this exchange, each mother had to bring her first-born to the temple on the 40th day after his birth, offer a sacrifice to God, and redeem her infant in order to obtain the right to get him back, while transferring his obligations to the priests. Such is the origin and the meaning of Old Testament priesthood. However, all these institutions, though established with God’s approval, were only human prerogatives and thus lacked grace, because they only served to foreshadow the future. The service of the priesthood openly prophesied to the people the forthcoming High Priest and the forthcoming salvific Sacrifice. All Old Testament “gifts and sacrifices… were imposed on them until the time of reformation… but Christ the High Priest, neither by the blood of goats and calves, but by His own blood entered once into the holy place, having obtained eternal redemption for us” (Hebrews 9:9-12). Faced with the Infant Christ, the entire Old Testament priesthood could be considered as having fulfilled its temporary foreshadowing service and could say to Christ together with the elder Simeon: “Lord, now lettest Thou Thy servant depart…,” and not only in terms of wishing quick deliverance from earthly life, but also quick deliverance from its priestly service which was inactive (i.e. lacking grace) in the face of the eternal High Priest and the redeeming Sacrifice. The content of the holiday service reveals to us the chief meaning of the coming of the Son of God to earth, which lay not in a glorious establishment of a universal earthly kingdom of the Messiah, as the leaders of the Jewish people wished it, but in His service as a High Priest to the world and in His priestly sacrifice of atonement. The elder Simeon speaks of this to the Most-Holy Virgin Mary, as he prophetically views Her future station at the Cross and likens it to a sword piercing Her heart. And the elder himself, already seeing in the Divine Infant the beginning of the redeeming sacrifice for which He had been born, expresses his desire to descend as quickly as possible into hell, in order to proclaim to the prisoners languishing there the great joy of the first rays of the Paschal Sun (7th ode of the canon). Amen. Today’s feast is the celebration of man’s meeting with God. The entire meaning of our life lies in seeing Christ before our death, and in aspiring to this just as did the righteous Simeon, to whom the mystery of life and death was revealed in the Divine Infant – the mystery of God having to take on our death. It is the chaste and holy Prophetess Anna who brings these terrible tidings to people by saying that the Infant Christ Who has come down to earth will take on death in order to give us life. To give us His life, so that we, too, would be able to give our entire selves to Him, give our whole life and even our death, just as He gives His entire self unto death for us. And this is what constitutes the Meeting of the Lord, i.e. our meeting with God. This is why the feast announces to us the prophecy that “behold, this Child is set for the fall and rising again of many…” (Luke 2:34). And towards the Mother of God are directed the words that “…a sword shall pierce through Her own soul also, – that the thoughts of many hearts may be revealed” (Luke 2:35). A meeting with God is inescapable for every person, and it takes place here, on earth, before there is that other meeting – the final and eternal one. Everything in a person’s life is decided in relation to the person’s attitude towards Christ, and there can be no middle ground here: either we are with Christ our God, or we are against Him. This was revealed when the Lord was crucified upon the Cross, and continues to be revealed throughout the entire history of mankind. This will also be revealed when the Lord appears for His last meeting with us, to judge the whole world, so that some will always remain with Him, while others will be rejected. And here, too, there is no middle ground and cannot be any. A great multitude of people turn from sinners into saints. To this day we see the miracle of the blind seeing, the deaf hearing, the lepers being cleansed, the poor rejoicing. This mystery, wherein Christ becomes the stumbling block and temptation for many, against which many stumble and fall, continues to exist to this day. And no one can say that he is able to bypass this stumbling block. Either it becomes the foundation of eternal life, or it will be a block against which the person will stumble and fall and be crushed. Not a single person can remain neutral in regard to Christ, no matter what knowledge he may or may not have about Him. For a while, but only for a while one can refrain from participating in all that happened to Christ and shall be happening until His last hour, until the Second and glorious Coming of Christ. But the time is coming when our silence becomes participation in iniquity and lawlessness. This is what today’s feast tells us. Even the people who appear to be outside the church, who appear to not even know Christ or have any wish to know Him, in reality participate in the meeting with Him. Nowadays it is terrible to be indifferent, because unconcern and lack of feeling promote the lawlessness that is revealing itself more and more in the history of mankind. It is precisely due to indifference that the harshest tyrannies exist in the world, which always base themselves upon human unconcern, and their entire power rests upon it. If people were not indifferent and senseless, these tyrannies would never have been able to survive in all their cruelty. In this life, even before death comes, every person is summoned to meet Christ, just as was the righteous Simeon. This constitutes the sole meaning of every person’s life. But perhaps the most terrible thing is when a person, while still living on earth, through his own indifference dies a second death, as the Apocalypse tells us, even before his actual physical death comes. His soul becomes deadened, insensitive to good and evil, and thus he dies an eternal death – the death by which people are punished for the most terrible and unrepented sins. All of this is happening throughout the entire history of mankind, among every people. With the Russian people this occurred quite recently, when Christ appeared in His Church for the rising of millions – in the glory of martyrdom, and the fall of millions – through their rejection of faith. And today, when insane iniquity and immorality are being cultivated among all of mankind, the choice between good and evil becomes even more marked, while the pressure of the evil forces surrounding every Christian is passing all boundaries. Today it is so precious and so important to stand firm in Christianity. More precious than ever before, because today evil is revealing itself in its entirety. We must stand firm. We must stand firm in our loyalty to Christ, otherwise there will be no meeting between mankind and God. Today’s feast tells us that the Lord summons all of us to stand on the side of Christ wherever His battle against evil and the devil is going on. And the Church joyously proclaims through the mouth of the righteous Simeon that salvation is opening up for all people. But only those will be saved who remain faithful to Christ, especially in our times, when everything is being done to prevent this. We pray to the Lord and to the Mother of God for all people to be given this gift – to remain faithful to God and to await a meeting with Him. And amid the feast the Mother of God prays for all of us. Through great sorrows, through great suffering we and all those people who appeal to the Lord and for whom the Mother of God entreats are due to come to repentance, to the miracle of arising from our fall! But no matter how great these sorrows, may the Lord grant us a single wish for ourselves and for all people: that the sorrows serve to make our lives more profound and bring us closer to our meeting with God. And even death itself, no matter it what form it may be given to us, is the perfect revelation of this joyous meeting. Amen.